In a smart move by Amazon, shortly before announcing the new Kindle Fire HD family of products to the world on September 6, 2012, the company acquired the domain name KindleFireHD.com. According to Whois records, the name switched hands from its previous owner “Nathaniel Sawbo” to Amazon. What is known (after some sleuthing) is that Amazon now owns the domain, but what isn’t known is if Amazon had to pay some money to the name’s original owner or whether the company threatened legal action. On the very same day Amazon unveiled the first generation Kindle Fire in 2011, the company registered well over 500 domain names related to the Kindle Fire and Silk browser products, through the internet brand protection company MarkMonitor. While Amazon managed to secure the rights to names like KindleFireScreen.com and KindleFireDisplay.com, it failed to obtain KindleFireHD.com. Today, KindleFireHD.com is a blank web page and is registered anonymously through Go Daddy’s Domains By Proxy service, but it takes only a few simple steps using Go Daddy’s public account retrieval system to figure out who is behind the domain. It’s what some might call a “slight flaw” in Go Daddy’s account retrieval system which allows you to figure out the owner of a privately registered domain as long as you know the e-mail address of the registrant. On my first and only try, I used hostmaster@amazon.com, and was able to quickly confirm Amazon as the owner. First, I went to Go Daddy’s Account Assistance page. Next, I clicked on Retrieve my Customer #, then entered kindlefirehd.com for the domain name and hostmaster@amazon.com for the e-mail address. After entering the security code, I clicked Submit, as shown in the screenshot below. Unlike Apple, one of its biggest competitors with a reputation for announcing products before owning the domains, Amazon has a much better track record. Amazon owned KindleFire.com when it unveiled the tablet. The company owns Kindle.com and other product names like KindleDX.com. To this day, Apple doesn’t even own iPad.com. Amazon may even have a shot at owning FireHD.com, which has surprisingly expired according to Whois. If you browse Amazon’s website, you’ll notice the company uses “Fire HD” (minus Kindle) quite a bit, so it may be in the company’s interest. 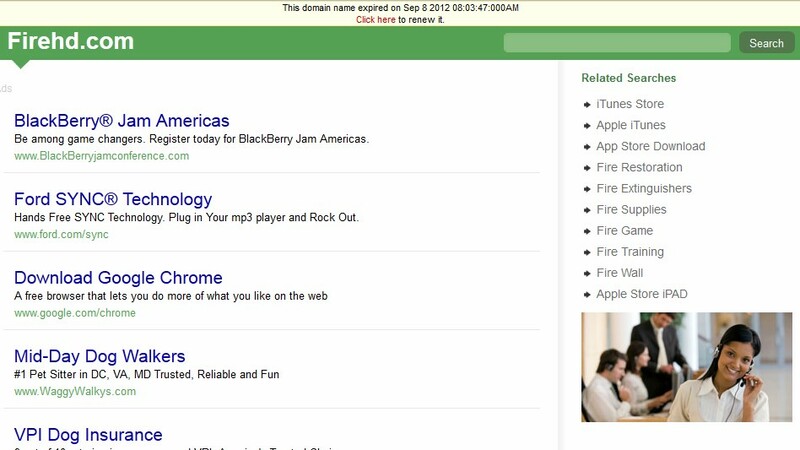 The domain name will be available to the public on October 3, 2012, if the owner doesn’t renew the name in time. I’ve reached out to Nathaniel Sawbo, KindleFireHD.com’s original owner for more information on the transaction and will update this post if I hear back. Interesting from the list published on theDomains.com that Amazon also registered kindlefirehdphone.com . . . pre-empts future tech coming from Amazon? It’s all about buying domain names for brand protection, speculators will always be around to try and pre-judge the next big named release and buy related domain names.